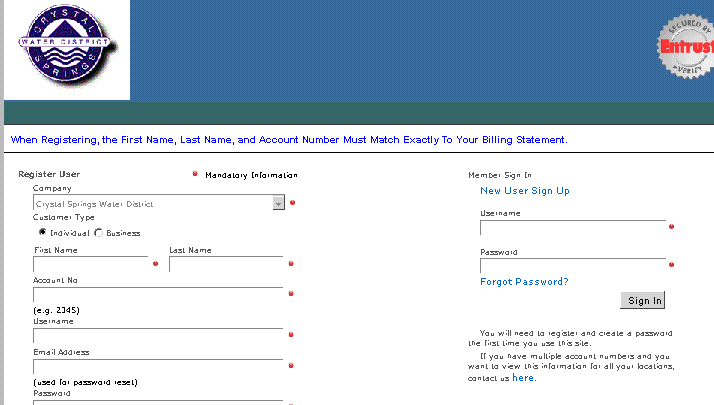 New User Sign up instructions for online bill paying and access to account data. 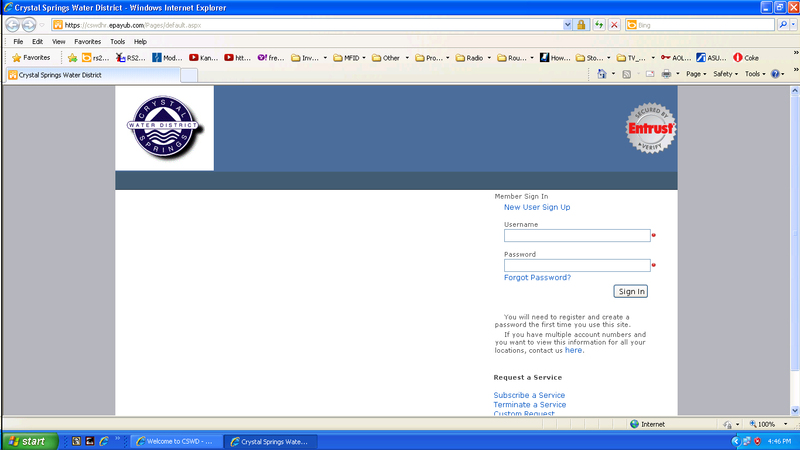 Note the statement in blue on the registration display below. “When Registering, the First Name, Last Name, and Account Number Must Match Exactly To Your Billing Statement. “ It would be good to have your last bill in front of you while registering. The bill will have the First Name, Last Name and Account number exactly as needed for registration. Company is automatically selected for you. Skip to the First Name entry box and begin registration. 3. Continue registration by filled in each entry area with the red dot. Passwords should be 8 characters or more in length with at least one capital letter and one number. 4. 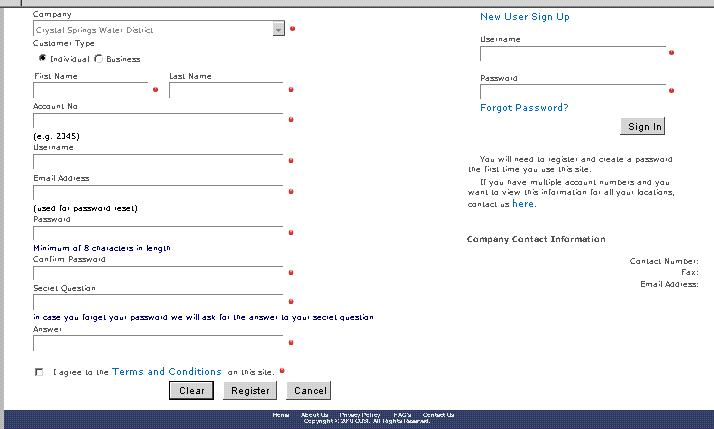 Check the “I agree to the Terms and Conditions on this site” box shown in the illustration below. 5. Click on Register to complete your registration. The sign in window below will reappear. Enter your new user name and password for secure access into the on line bill paying and account data portion of the CSWD web site. To exit the online Bill Paying and Account information display, click on the close window X in the upper right corner. 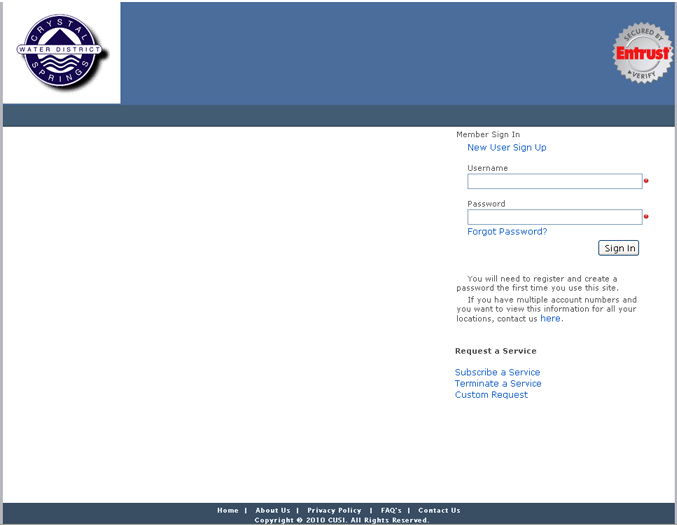 This will return you to the CSWD web site. This is illustrated using the sign in window.